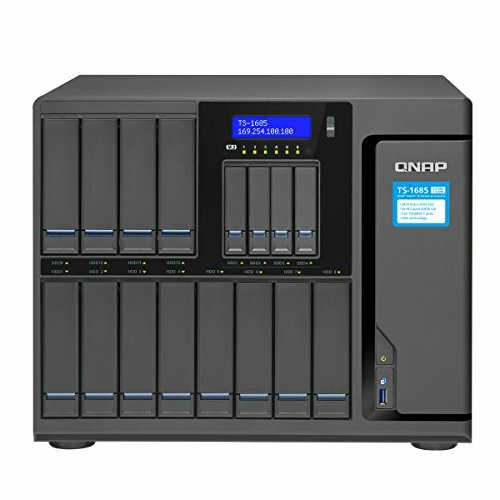 Supporting up to twelve 3.5" HDDs and four 2.5" SSDs, the TS-1685 is a high-capacity, robust, and reliable business NAS powered by an Intel Xeon D processor. Designed to optimize enterprise IT infrastructure, the TS-1685 comes with three Pie slots that support 10GbE/40GbE NIC, Pie NV Me SSD, graphics cards, and USB 3.1 expansion cards. Incorporating security and scalability, the TS-1685 presents an ideal choice for a complete business-ready storage solution with cross-platform file sharing, comprehensive backup and disaster recovery, iSCSI & virtualization, and more business applications.